The latest trend in pool design combines sport and resort for a pool that does triple duty as the home’s showpiece, social hub and gym. A pool designed for exercise and entertainment can be a wise investment-increasing your home’s value and enhancing your quality of life. The latest trend in pool design is Resort and Sport. Florida Custom Home Builder Jorge Ulibarri says clients these days are asking for pools built for a workout and a party. “Clients no longer want the lagoon-style pool with its boulders , cascading waterfalls and meandering shapes. Although these pools are pretty to look at, they aren’t as functional as the more contemporary, sleek designs,” explains Jorge, who is building a Sport and Resort-style pool for one of his clients that embodies this latest trend. 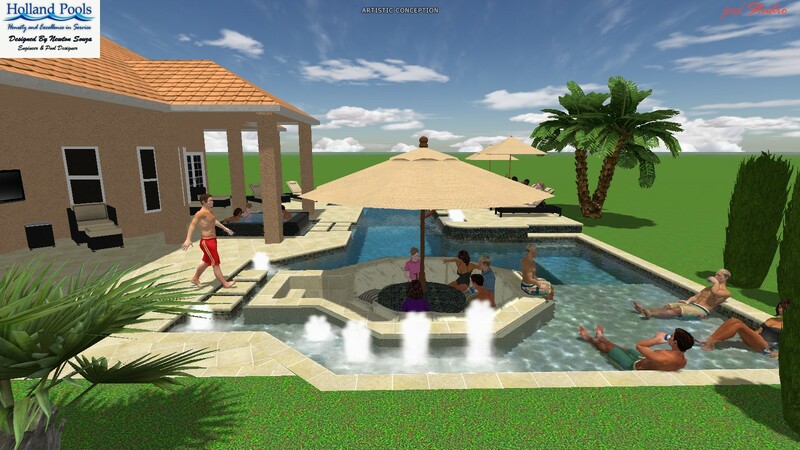 “Today’s pool designs are more contemporary and polished looking with clean lines. From a cost perspective, this look is affordable depending on the types of finishes the homeowner chooses. The beauty comes with the pool’s contrasting colors and mosaics. The contemporary style lends itself to a lot of creativity as opposed to the lagoon-style pool and its limited design,” says Jorge. 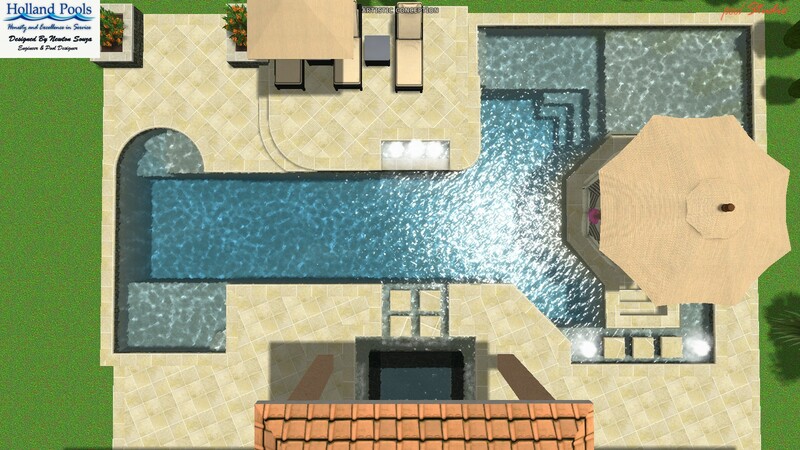 The design of a pool is dictated by its function. The homeowner wants this 1000 sq. ft. pool to become part of his fitness routine so its design spans 80 feet long to accommodate swimming laps. (Note a 25-yard pool is considered standard lap pool.) As an added bonus, the pool’s length makes it visible from every window of the house giving it a resort look. The saltwater pool integrates with the outdoor covered living room via the spa, where water gracefully spills over the sides and flows back to the pool. Bubbling fountains throughout contribute to the soothing, melodic ambiance. The budget for this pool is on the higher-end but Florida Custom Builder Jorge Ulibarri says there are always opportunities to save. 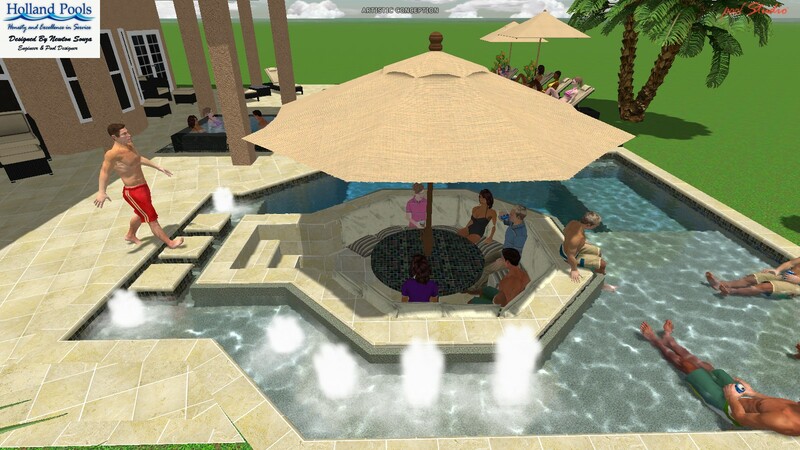 In our next blog posting, we’ll give you some money-saving tips on the latest trends in pool design. Check back and be sure and subscribe to our blog and video series Trade Secrets for more affordable design ideas. Reblogged this on Trade Secrets by Jorge.